Season 2 of The Flash picks up where season 1 left off. When we left Central City in S1, the Reverse-Flash had been defeated, at the cost of Eddie Thawne's life, and Barry had finally got justice for his mother. Caitlyn and Ronnie got married in a small ceremony consisting of the main cast.The celebration was cut short, as a singularity forms over Central City. The season ends with the Flash running around the singularity in order to stop it. Season 2 begins by resolving this event. As it turned out, Barry could not stop the Singularity, so Ronnie and Martin Stein had to separate in the middle of the vortex to stop it. The city was safe, but Ronnie did not survive the separation. Barry's confidence took a hit, saddened by Ronnie's death and the idea of being rewarded, when it was Firestorm who saved the city. His friends manage to comfort him, just in time for new meta-humans to show up and threaten the city. As well as these mysterious meta-humans, a man named Jay Garrick appears and explains that both he and the metas are from an alternate earth; Earth 2. It is revealed that an evil speedster named Zoom is sending them through dimensional "breaches" to kill the Flash. Also through the breaches comes the Earth 2 Harrison Wells, who is looking for help to resume his daughter, whom Zoom kidnapped on their Earth. We also see the introduction of Wally West, son to Joe and brother to Iris. Wally is a rebellious and impulsive teen, who has a hard time adjusting Joe and Iris. The season progresses with many new meta humans, time travel, and even a trip to Earth 2, where they save Well's daughter Jesse. Far to much to do justice in a single article. We see Earth 2 versions of Iris, Barry, and Joe. We also see super-powered versions of Cisco, Ronnie, and Caitlin whom all work for Zoom. Grade makes a reappearance, which ends with him being sent to Gorilla City (Stay tuned for more of him in S3). We also see the return of the Reverse-Flash and it is revealed in the episode that this is the first time he had been in this time period. The season takes a darker turn in its second half, as Barry loses his speed to Zoom who takes over central city. Zoom proves to be one of the darkest villains in the Arrowverse during this time. In an attempt to get his speed back, Barry is pulled into the Speedforce where he spends and episode. Cisco is able to use his developing powers to open a breach, and he and Iris bring Barry back. With Barry back, the team manages to defeat the meta-human army that Zoom brings over form Earth 2. Zoom retaliates by killing Barry father Henry, trying to drive Barry to kill him for revenge. Barry is broken at the loss of his father and wants revenge on Zoom, but refuses to kill him. Zoom challenges Barry to a race, for the fate of both his world and Earth 2. Wells, finds out that Zoom stole a dangerous device from Mercury labs, called a Magnatar. Zoom wanted to use the race to power the device and destroy every Earth n the multiverse. Barry agrees to the race and defeats Zoom. Zoom once again taunts Barry for not killing him as Time Wraiths appear and take Zoom, ending the danger. After Barry defeats Zoom, he returns to Earth 2 to rescue another speedster that Zoom had captured and was holding in his hideout. His mystery character had made appearances multiple times in the season, but his identity had remained a mystery until then. 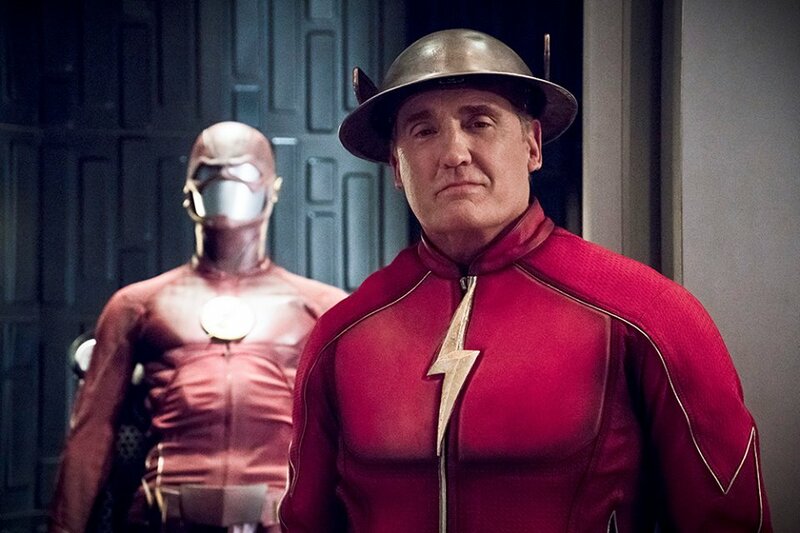 It turned out to be the real Jay Garrick. He was the Earth 3 version of Barry's father Henry Allen and was captured by Zoom when he fought him on his Earth. Jay thanks the team for saving him and agrees to take Wells and his daughter Jesse back to Earth 2, where they can find a way to return him to Earth 3. With that kind of ending, it is obvious to some where S3 is going to begin. A version of the "Flashpoint" storyline will be happening for S3. This is very exciting for comic book readers and will be a really cool thing to see play out for those who are unfamiliar with the Flashpoint storyline. Given the way that super hero shows are written, we will not see a direct adaption of the Flashpoint, but rather a reimagining of it for the Arrowverse. Flash starts next week and will start of the Arrowverse shows, with Arrow, Legends of Tomorrow, and Supergirl following close behind. It is truly an exciting time for all fans of Superheroes.